Dieffenbachias are very much loved as houseplants for homes and offices, simply because of their irresistible foliar beauty and their great tolerance for shade. Their splendid foliage variegation is so extensive that gardeners are now spoilt for choice! One cultivar worthy of mention is Dieffenbachia bowmannii Cariere that offers something else too. Truly an outstanding bloomer that will flower ever so frequently to cheer you! How about seeking out this floriferous beauty, yes? Even when not flowering, its handsome and beautifully spotted foliage will present a spotlight for your indoors or outdoors! Moreover, it’s so easy to grow, needing little care and is known to purify and clean the air around. Aren’t these reasons enough to make you want to grow it? We’ve been growing several varieties of dieffenbachias for many years as we just love these green friends! But, never knew that they can produce flowers until D. bowmannii Carriere joined our garden in July 2006 as a young plant and surprisingly flowered 8 months later and ever since then. Over the years, we’ve observed it flowering repeatedly after every third month or after the emergence of a set of 3-4 new leaves. Remarkably, it seems to be blooming non-stop year round as the long-lasting flowers last about 2 months with 4-5 buds bursting forth in succession from start to finish! 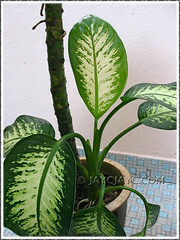 Etymology: Dieffenbachia is named in honour of Herr J.F. Dieffenbach who oversaw the imperial gardens at Schonbrunn Castle in Vienna in the 19th century. Its common name, Dumb Cane came about due to the temporary mouth numbness that result from ingesting its leaves or stem that contain raphides, a poison that swells the tongue and throat. 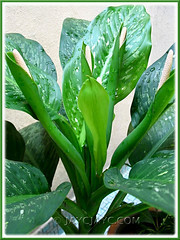 Features: ‘Carriere’ is a named cultivar of Dieffenbachia bowmannii, one of the numerous species of the genus, Dieffenbachia. A gorgeous dumbcane specimen, slow to moderate-growing, with an upright growth habit and can reach 2-3 meters tall if attached to a support and spread out about a meter wide. 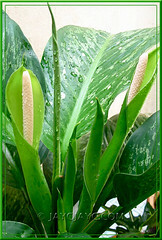 It is an evergreen perennial in the tropics and an annual in non-hardy regions, grown for its ornamental foliage beauty. 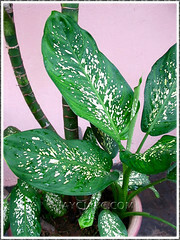 Typical of the traditional large-leaved dumbcanes, Dieffenbachia bowmannii Carriere has a fairly broad and erect, cane-like herbaceous stem, bearing large and arching petioled-leaves that are dramatically variegated and fabulously mottled and veined in varying shades of green and white splotches. Impressive and eye-catching foliage indeed! 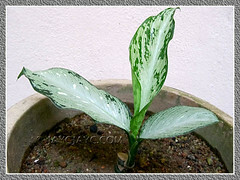 Leaf variegation will change slightly due to the intensity of light received. Nonetheless, a newly emerged blade starts off in fresher green and gradually deepen to a darker green with bluish tinge as it ages. The large glossy and textured blade is slenderly ovate, approximately 30-45cm long and 15-20cm across at its broadest. Papery and simple, the leaf has a slightly undulated margin, faintly veined, and an underside that is rather dull colour-wise. Lower leaves are lost with age, hence resulting in the stem being leggy and top-heavy, and may need a stake for support. The plant does sometimes throw out suckers. In favourable conditions, it will produce long-lasting flowers periodically throughout the year. 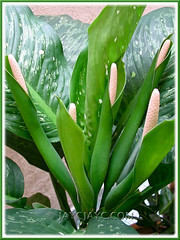 Being characteristic of plants in the Araceae family, its inflorescence held on a short peduncle, comprises of a whitish cylindrical spadix bearing tiny inconspicuous flowers and a light green spathe, with its top half resembling a hood while the lower half (female floral chamber) is tubular-shaped and somewhat constricted in between. Usually a whorl of 4-5 inflorescences is borne centrally atop the stem during each blooming event, rather unusual we think! Check Exotic Rainforest’s site to know further about the make-up of an aroid’s inflorescence and pollination. Beware: All parts of Dieffenbachia contain the poisonous, raphides, that if ingested, may irritate the mucous membranes and cause swelling and inflammation of the tongue and throat. Know more about the effects of its toxicity at eMedicine MedScape and MedLine Plus. And it is toxic to cats and dogs as well! 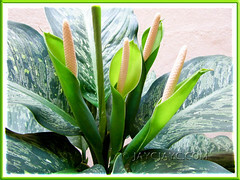 Culture (Care): This spotted dumbcane, Dieffenbachia bowmannii Carriere is an easy plant to grow and maintain. With favourable conditions, it can last for several years. Light: Bright light or filtered sunlight for best foliage coloration and vigorous growth. Avoid direct sun that will scorch its leaves. Tolerates low-light to shade, but it will cause leaf variegation to fade, similarly too if light levels are too high. Maintain warm to moderate conditions at all times. Moisture: Water moderately and regularly, keeping it evenly moist but not water-logged. Allow the surface to dry out slightly between waterings. It enjoys high humidity, so mist the plant regularly or stand potted houseplant on a saucer of pebbles filled with water to just below the base of the pot to prevent browning of leaf margins caused by dry air. 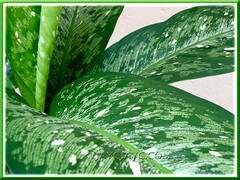 And, to further maintain humidity for houseplants, keep the leaves dust-free by wiping them with a moist cloth. If grown outdoors, give it a regular shower with a garden hose to wash off the dust in hot seasons. Soil: Tolerable to any kind of well-drained potting medium, though humus-enriched soil is beneficial. Others: Try to provide bright light for best growth and foliage colouration. Always use caution when handling the plant or cuttings as its poisonous sap can irritate the skin or cause allergic reaction. Best to wear a glove if necessary and avoid touching your eyes when handling any Dieffenbachia species. Remove burnt or withered leaves to keep tidy. When plant becomes leggy, cut back the stem to within 10cm from base to rejuvenate it, whereby new shoot will sprout at the point where it’s cut and use the cuttings to propagate new plants. Feed with a liquid fertilizer for foliage houseplants once every fortnightly during growing season and sparingly in cooler climate. Dumbcanes are generally free from serious pests or diseases, but do check for scales, mealy bugs and aphids that may infest it occasionally. For subtropical regions: Hardiness: USDA Zone 10b-11. Avoid too cool conditions, drafts and fluctuating temperatures indoors that may cause yellowing and wilting of lower leaves. Low light may retard growth and dull the leaf variegation, so provide bright light indoors for optimum growth. Water regularly in hot summers but sparingly in cooler seasons as with less feeding in winter. 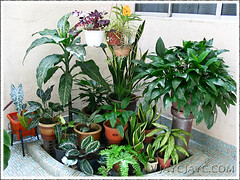 Repot if necessary in spring and propagate new plants from mid-spring to early summer. It’s not frost hardy, so best to grow it in a container that can be overwintered indoors. Propagation: Easily by tip cuttings, stem cuttings or removing suckers that emerge occasionally from the base and grow as new plants. 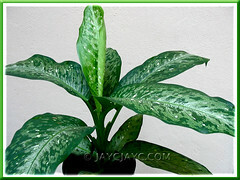 Usage: Dieffenbachia bowmannii Carriere is an excellent choice as decorative houseplants for homes, offices and public places or in greenhouses. Great for container gardening. Ideal too when ground-grown as a shrubby plant in gardens as an accent or single specimen, and even as lovely as a feature in mixed displays for added interest and attraction. Besides, it’s also widely known to purify and cleanse indoor air! Check at Wikipedia for the list of air filtering plants and here’s an interesting read on FAQ on indoor air pollution by Wolverton Environmental Services, Inc. I didn’t know they bear such lovely pink flowers. All this while, I thought the flowers will be white like the peace lilies. I think this plant is too gentle to be called a MIL tongue, lol! Have a happy weekend, John and Jacqueline! Their lovely flowers are whitish with a tinge of cream, Autumn Belle. Hehe…I was wondering too why it was nicknamed MIL tongue…probably the shape of its spathe, huh! Have a lovely Sunday, my friend! I have been trying to find dieffenbachia bowmannii and cannot seem to find them in stores in my areas if indianapolis indiana I see trpoical snow’s everywhere can u help me to locate a buyer so that I may purchase a plant. Sorry, we don’t know any seller, Jodie!